Neoprene zipper sleeves to fit tablets and laptops. Durable, soft wetsuit material protects devices. Two-way, heavy duty zipper closure. 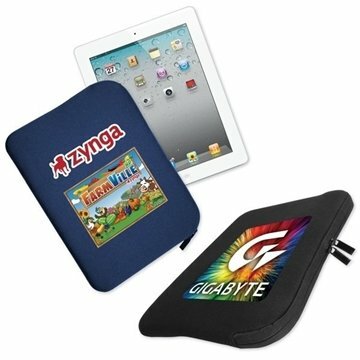 Padded for travel with tablets, iPads and laptops without bulk. Wide variety of sizes available to fit your needs. I liked the way it looked overall. I am happy with it. Great item for that cost and was ideal for its purpose. Fantastic product! We are really proud to provide these as marketing products for the programs. Rosa was extremely helpful and the order turned out perfect. Thank you.